Em Cooper is a British film director and animator, and former Associate Producer & Editor at Current TV, in the UK. 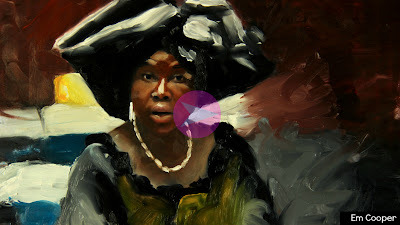 She is an artisan in film making, in combining oil painting with animation. Cooper is particularly inspired by psychoanalysis, (the theory of mind), which was originally developed by Sigmund Freud. Psychoanalysis is used to explore internal conflicts, repression and unconscious impulsions. Much of this is exuded in her films. For example, she introduces “Is This Love”, a film that depicts a volatile relationship between a young woman and her abuser. The character persistently denies the sanctity of her own physical well-being, as she continues to forgive her lover. She is in engulfed by this unrealistic idea of love and can’t seem to face her gamble with fate. This young woman is caught between reality and fantasy. Her instinct says leave, but her heart wants to “rescue” the abuser. It’s a herculean task and obviously unrealistic. Many of Cooper’s pieces exposes the psyche, how human beings think, feel and exist in certain situations. She intrigues her audience as many may find themselves identifying with some of the characters. Cooper is an artist and intellectualist by all accounts. She is an enthusiast of human engagement. Being able to energize an audience is fundamental. Connecting with the human spirit is a pattern amongst her work. Her sense of personal study is rare in both animation and movie-making. While working at Current TV, Cooper was exposed to films that failed at getting commissioned, even though they composed decent stories. They lacked a sense of sustainability for viewers. She learned that a film maker had to facilitate listeners and possibly seduce the human spirit. Far more compelling, is the likeness and similarities between reality and paint, as Cooper seizes the physical depth of a person and mirrors their characteristics in animation. She combines this sort of oil-on-glass animation with live action footage. This distinction in her work has led to being popularly commissioned. She is currently in post-production for "Kiss the Water", a documentary by film director Eric Steel of “Julie & Julia” and “Shaft”. The film airs in Tribeca next month. Creating the work is slow and intense but maybe that's what makes her films so provocative. Em feels that it is imperative to explore a sense of self and personalization in ones own work. Obviously, uniquity can take them a long way, much like her craft in portraying elements of psychoanalysis. She is commissioned based on what she brings to film. Had she been a cinematographer, she explains, circumstances may or may not have been different. The field is a lot more technical. Fewer women opt for cinematography. Though, women in film are making tremendous strides, there is a need for diversity to fill these gaps. She encourages potential film makers to be diligent in their pursuits. Rejection comes with the territory. It's part of the process, but it should never deter the anticipation of becoming a success. Her film, “'30% Women & Politics in Sierra Leone', made with Anna Cady” serves as a clear indication that women are taking leaps across the globe. It was selected for the Sundance Film Festival this year. It’s a story about the political corruption in Sierra Leone, as women attempt to embark on political leadership. The task appears to be toilsome and grueling, but without the strength of these women who attempt to try, the picture for women and girls would be oppressive and bleak. Cooper says women have to pay attention to the hardships and obstacles, and continue to fight and work towards change anyway. Cooper may exemplify what many women and girls may envision on the other end of a rainbow, a dream fulfilled, what one may achieve with diligence and anticipation.